Over 30 dogs and cats, refugees from Hurricane Irma, arrived in Chicago Saturday from shelters in Florida. CHICAGO (WLS) -- Over 30 dogs and cats, refugees from Hurricane Irma, arrived in Chicago Saturday from shelters in Florida. Hurricane Irma, a category 3 storm, is expected to bring 125 mph winds up Florida's west coast, hitting land early Sunday morning. In one of the biggest evacuations ever ordered in the U.S., about 6.4 million people in Florida - more than one-quarter of the state's population - were warned to leave. The Anti-Cruelty Society took in 15 dogs and over 15 cats from shelters in Lee County, Florida, in addition to the 84 dogs and cats taken from shelters in the Houston area Monday. 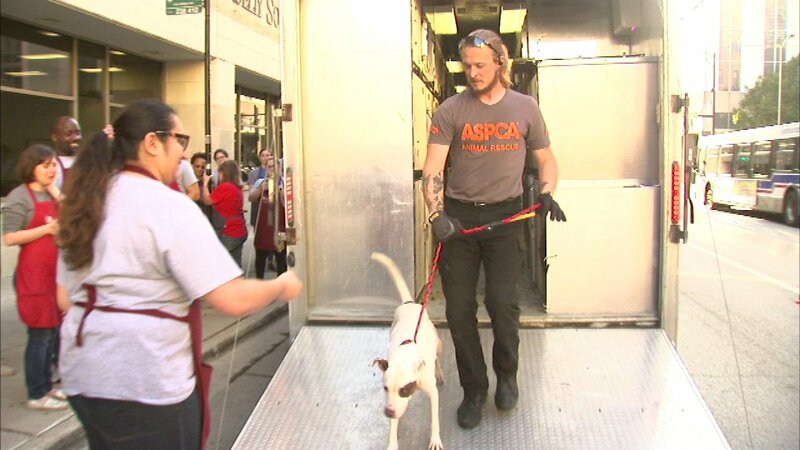 All the dogs were scheduled to receive physical exams as they arrived in Chicago, the Anti-Cruelty Society said. Cats will be examined the following days. For more information on how to help the Anti-Cruelty Society, click here. To fill out a foster intent form for pets rescued from Hurricane Irma, click here.